A 1950 Ferrari 166 MM / 195S Berlinetta Le Mans sold for $6,490,000 as the top result at the Gooding Scottsdale 2016 classic car sale. In contrast to other auction houses in Scottsdale 2016, Ferraris were the top three lots at the Gooding sale. However, several top Ferraris were amongst the million-dollar cars that failed to sell. Ferraris played a smaller role than usual at the auctions of both RM Sotheby’s and Bonhams at the 2016 Scottsdale, Arizona, sales. At Gooding, Ferraris were always going to be the top lots, even if several failed to reach the reserve margins. 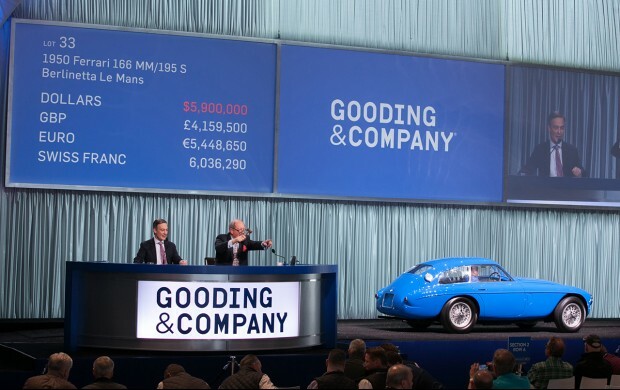 Gooding’s top result at the 2016 Scottsdale classic car auctions was as expected for the 1950 Ferrari 166 MM / 195S Berlinetta Le Mans, chassis 0060, that sold for a strong $6,490,000 – a new model record. This car was shown at the 1950 Paris Salon and one of just six Touring Berlinettas built on the 166 MM chassis. It was the first closed Ferrari competition car delivered to the USA. More important, the car was twice raced by the Scuderia Ferrari with results including an outright victory at the 1950 Giro delle Calabria. After the car was sold to Brigg S Cunningham, Ferrari upgraded the specification to that of a 195S. It competed in various races in North America for three years. The second highest result at the Gooding Scottsdale 2016 auction was $3,410,000 paid for a 1967 Ferrari 330 GTC Speciale. This was also a model record. Only four 330 GT Speciales were ever built with this car originally driven by Maria Maddalena Da Lisca – a Tuscan heiress and wife of Piettro Barilla, the famous pasta maker. She drove over 33,000 km in the car in less than two years while only 24,000 km were added since. 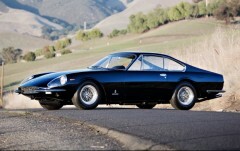 The standard Ferrari 330 GTC in the same auction failed to sell at a highest bid of $675,000 – not far off the estimate. Ferrari Enzos have been gaining fast in value in recent months. The 2003 Ferrari Enzo that Gooding sold for $2,860,000 was only the third Enzo to have sold for over $2 million – the others were both sold by RM Sotheby’s last year: the Enzo made for the Pope for $6 million at Monterey 2015 and a near new Enzo that belonged to Floyd Mayweather at New York 2015 for $3.3 million. The 1995 Ferrari F50 received a highest bid of $2.1 million but sold post-hammer for a model record $2,400,000. The 1990 Ferrari F40 that sold for $1,534,500 was the sixth highest result at Gooding Scottsdale 2016. This Ferrari was the original F40 Geneva Auto Salon launch car. The 1929 Duesenberg Model J Dual Cowl Phaeton attracted much attention and finally sold for $2,420,000 at the top of the estimate. The car received a show-quality restoration by Fran Roxas but retained its original chassis and engine. The car was originally owned by John Duval Dodge, son of one of the founders of the Dodge Brothers Company. It is believed to have been the only Duesenberg ever sold new in Detroit. RM Sotheby’s sold a 1927 Duesenberg Model J Disappearing Top Torpedo Convertible for $3 million. Gooding had three of the seven Mercedes Benz 300 SLs on offer at Scottsdale 2016. The 1954 Gullwing failed to sell at a highest bid of $1,000,000. A barn-find 1957 Roadster sold for $792,000 – more than $100,000 below the lower estimate. It seemed that following the craze for barn finds and original condition in 2015, buyers have begin to price in the considerable cost of restoration of such vehicles. The 1959 Mercedes Benz 300 SL Roadster sold for $1,155,000 – around $100,000 below estimate. RM Sotheby’s similarly sold three 300SLs at the lower end of expectation but Bonhams had more success with its 1962 Mercedes Benz 300 SL Roadster selling for a solid $1,485,000 but also below it was expected to achieve. 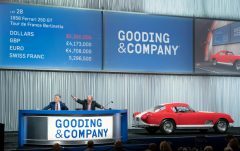 The 1955 Alfa Romeo 1900 SS Coupe Speciale entered the Gooding 2016 Scottsdale auction without an estimate as the value of these cars are hard to determine. The car has a one-off Boano coachwork and is in a very original condition. It was shown in 2015 in the invitation-only Preservation Class at the Pebble Beach Concours d’Elegance. The car was struggling to find a buyer at $500,000 but bidding crept up slowly to a more respectable result of $990,000. The 1948 Alfa Romeo 6C 2500 Super Sport Cabriolet sold just above the higher estimate for $1,012,000. A 1955 Bentley R-Type Continental Fastback struggled to find a buyer with the $1,017,500 paid well below the $1.3 – $1.6 million estimate. A 2005 Porsche Carrera GT sold post-hammer for $980,000 – it came closer to the million-dollar mark than others at Scottsdale with several further Carrera GTs lined up for Paris the following week. A 1931 Bugatti Type 49 Grand sport sold for $962,500 – well above the pre-auction estimate of $550,000 – $750,000 estimate. The highest bid for the 1966 Ferrari 275 GTB Long Nose was the price RM Sotheby’s achieved earlier (premium included) for a very similar car. Three of the around 200 Ferrari 250 GT Series II Cabriolets ever produced were on offer at the Scottsdale 2016 auctions. Gooding failed to sell two while RM Sotheby’s sold one for $1,650,000 – well below estimate. Both auction houses also failed to sell 1985 Ferrari 288 GTOs – prices on this model may have moved too fast at recent auctions. Of the large number of Ferrari 365 GTB/4 Daytona Berlinettas that came to market in January – both at Scottsdale and Kissimmee – only Bonhams managed to crack the million-dollar mark. Others fell well short with many going unsold with owner’s hopes clearly exceeding what buyers are willing to pay. See also: 2016 Gooding Scottsdale Auction Preview for more on these cars.